Summer is dreamy late nights—the sky rimmed in light, cold sips on sun-drenched patios, trips to the mountains, and the sweet release in our bodies as we embrace against warm winds. When fall arrives, we’re never ready. We want more of the action, the revelry, the charcuterie, the sun, free skin, the smell of blooms. But then fall gets here and we’re suddenly enchanted by the slow-down, the warmer blankets, comfier clothes, and the much-needed rest. In fall, we ground back into our lives and, at SATTVA we enhance the season with a cleanse, sinking into this restorative season of life. To that end, we present you with 2 recipes, one fast, one slow, to inspire your exploration of the sattvic diet and reintroduce rest from the inside out. A simple staple, this sauce can be easily added to a variety of dishes during a cleansing season, and takes just a few minutes to make; it is the perfect substitute for recipes that normally rely on the creamy texture of dairy. Since cilantro is a very strong taste for some people, I recommend blending the rest of the recipe and then adding in a few leaves at a time, until your taste buds tell you it’s ready. Hack: substitute some lemon juice for lime and drizzle over a meatless mushroom taco salad for a hit of tangy goodness. Process until smooth and set aside 1/2 c. for the following recipe. Keeps in the fridge for 1 week. As our markets flood with inexpensive squash and root vegetables, nothing says cool nights and comfort like roasted seasonal delights. Spaghetti squash is aptly named: when cooked, the squash flesh separates into long noodle-like fibers that can be separated with a fork. 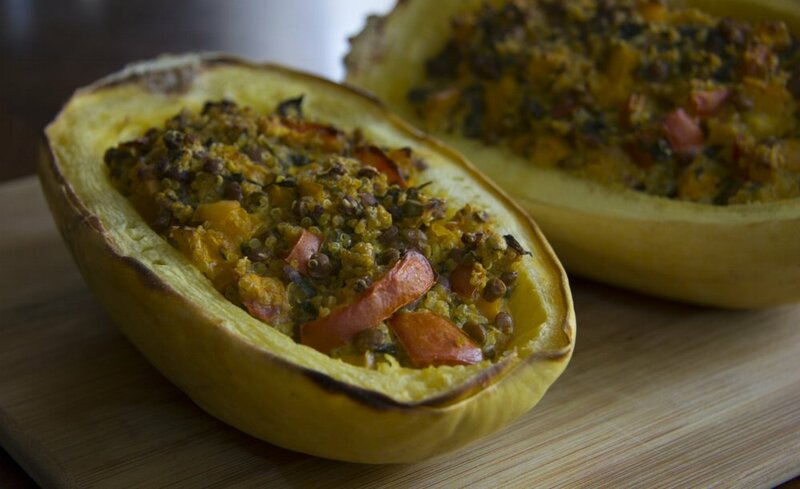 This recipe is made for a medium squash; the amount of filling and cook time varies with depending on the size of squash you buy. Also, if unavailable, all fresh herbs can be substituted for dry herbs. Halve a ripe spaghetti squash and scrape out the pulp and seeds with a spoon, leaving outer skin on. Brush the inside with a high heat oil (coconut or grapeseed) as well as a small patch on the underside where the squash sits on the baking dish. Place the squash in a baking dish and roast for 25 min, with the open-side of the squash facing up. Remove Squash from oven, stuff with filling, and bake for 25-35 more minutes, until a fork can easily pierce the squash flesh. Allow to cool, serve with extra cashew sauce and enjoy this sattvic goodness! Do you have some great go-to recipes while your cleansing? We would love to see them! Comment below or follow us on Instagram and share photos of your amazing cleanse creations by tagging @sattvayoga!